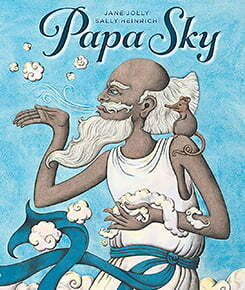 Yesterday the CBCA Notable list was released and Papa Sky is a Notable book in the Picture Book category. WooHoo!! Next step is the Shortlist, to be announced on March 27th. Fingers crossed for that one. It is a very long and very competitive long list. Lots of fabulous children’s picture books in the running…all worthy of going to the next level. So very exciting, Jane and Sally! Fingers crossed for the shortlist. Papa Sky certainly deserves to be there. Jane and Sally, congratulations on your inclusion on the Notables list. All the best as we anticipate the Shortlist. Thanks Susan, I will miss catching up with you this year at the non-existent CBCA conference. What a bummer that they couldn’t have it this year. I planned my holidays around it and now I will miss it next year. Boo! Hoo!